The view from an area without pediatric neurologists. A joint workforce analysis by the Child Neurology Society (CNS) and the American Academy of Neurology of the 1,290 members of the CNS and residents in pediatric neurology showed that 78% of pediatric neurologists work in urban settings and that the average wait time for an appointment with a pediatric neurologist is 45 days. In Wyoming, where the authors are located, the closest pediatric neurologist may be a 4-hour drive. Many families do not have the time off work or the financial means to travel such large distances for these visits. Thus, on a regular basis, my office receives referrals asking us to see preteen patients with neurologic issues. This is true for many adult neurologists despite having had only 3 months of pediatric neurology training in residency. There is no substitute for the best-trained expertise, and as the specialty of pediatrics understands, children are not simply small adults, and their nervous systems are still developing rapidly. With focused specialty training and experience working with children, child neurologists are more able to tailor evaluations, avoid unnecessary investigations and treatments, and identify those who need the advantages of new technology. “We have pretty good support for epilepsy, but where we struggle is evaluation and treatment of conditions such as headaches and chronic neurologic disease management,” says Dr. Peter Sidor, a pediatrician in Cody, WY. This sentiment is supported by Kang et al,1 who note that pediatricians increasingly desire assistance for complex neurologic conditions. Dr. Ryan Firth, a pediatrician in Lander, WY, notes the value of a neurologic team assisting with complex neurologic medication management. To best care for children with neurologic diseases, pediatricians and general neurologists need more professional support. The number of pediatric neurologists is not projected to increase anytime in the near future, and efforts to draw trainees into the specialty are needed, including increased exposure to the specialty in medical school, changes to the length of training, and creation of parity in salaries between adult and pediatric neurologists.2,3 In the meantime, innovative solutions are needed to deliver improved availability and accessibility of pediatric neurology care. Pediatric neurologists, adult neurologists, and pediatricians can work together to develop evidence-based algorithms for assessment and treatment that allow for team-based care at the highest level of quality. With such evidence-based care pathways, pediatricians may be able to initiate a care plan with the understanding that a pediatric neurologist will be consulted remotely or in person as needed. If an adequate evidence base does not exist, then best-care practices can be derived by the neurologists, pediatricians, and pediatric neurologists involved in a distributed care team. The care goals will need to be measurable, and every effort should be made to align these goals with available quality measures such as those recently published by the American Academy of Neurology or the Child Neurology Society. These teams may also use technologic solutions that allow child neurologists to be remote members of teams that care for children with neurologic problems. Perhaps the most critical aspect of enhancing access to pediatric neurology is to improve pediatricians’, general neurologists’, and pediatric neurologists’ practice efficiency, freeing time to be available for patients when and where they are needed, including via remote consults. When considering potential improvements to practice efficiency, the focus needs to be on maximizing the physician’s time with and ability to focus on the patient, as there is no substitute to time spent interviewing and examining the patient to reach the diagnosis and treatment plan. Team-based care requires changes to the roles and responsibilities of the members of the health care team. At the authors’ practice, Frontier NeuroHealth in Cody, WY, we are cross-training, so the patient may be greeted by a wellness coach who escorts them to a room and checks them in. The same individual may check them out (and explain to them what the doctor said) while coaching the patient. The coach may also assume the role of care coordinator and follow up with the patient between visits to ensure compliance with the plan. This individual is the de facto receptionist, health coach, medical assistant, and care coordinator. Advanced practice providers (APPs) are uniquely positioned with expanded medical knowledge and often more quality time with patients. APPs are able to review and verify the quality and accuracy of the data and further expand the clinical story. The team-based approach then pivots on the primary or principal care provider who knows the patient, the history, the physical examination, and the general medical issues better than anyone and who may direct inclusion of other medical specialists or subspecialists as needed. A high-performing care team combines all these various roles, saving resources while individualizing patient care. In our child neurology scenario, the pediatric team-based approach begins with the family and support staff abstracting the relevant patient data and capturing that information in discrete data forms. The family may be able to document relevant data via a portal or a digital device in the office. It is critical that this information is captured in discrete and well-defined data fields to facilitate effective use throughout the process. The typical medical information is categorized and collected at a regular clinical or hospital visit including history of present illness, allergies, medications, and vital signs. The more effective and accurate the initial data collection and abstraction process is, the more efficient the clinical practice will be. Child health improvement through computer automation (CHICA) is an example of a system that has been developed for that purpose.6 The families of patients are given an age-specific survey that upon completion is directly imported into the electronic health record (EHR), which can then alert the clinical care team about topics for further discussion at the office visit. As the patient continues to progress through the care team, the team escalates its level of training and expertise. APP team members verify the accuracy and completeness of the data as they expand the information base. In this example, the pediatrician will spend less time with the data acquisition and abstraction and more time with assimilating the information and treating the patient. This team-based approach, supported by technology, can improve practice efficiencies in all medical practices. Although technology is not a solution in and of itself (Box), it can be of great help in collaborations, especially those that exist across time and distance. Carrying the team-based approach deeper into the system, the general neurologist can support the pediatrician and pediatric neurology patient by contributing neurology-specific knowledge and further verifying and expanding the patient’s information database. As we continue to capture, verify, and expand patient-specific medical information in discrete data fields, we can exchange the data and support the care decisions. If the pediatrician and general neurologist happen to be on the same health information technology (HIT) system, the collaboration is easier. If not, a functioning health information exchange mechanism such as Commonwell or Care Everywhere or a state or regional health information exchange is needed. The technologic options for capturing information directly from patients and families may help build centralized and shared patient information. The hub-and-spoke approaches and options for using technology can assist in knowledge sharing and cross-training among team members. Technology is changing the definitions of “relevant medical information” and “point of care.” Internet of medical things (IoMT) devices can capture personalized digital information from wearable or implantable sensors and digital home devices. IoMT is the collection of medical devices and applications connected to health care information technology systems through online networks. Technology continues to make assessments of genomics, proteomics, and metabolomics more available and cost effective. The sheer volume of data is and will be overwhelming for any clinician to use at the point of care, as is the relevance of all this information. Artificial intelligence and machine learning algorithms integrating best practice guidelines, decision support, and practice process characteristics may contextualize relevant data for the presenting complaints and present the information to the prepared provider whenever and wherever he or she may see the patient. Optimal care begins with a correct diagnosis. This is best accomplished with an in-person neurology consultation and evaluation. Logistically, in rural areas, this is not always an option. Although telemedicine is bridging geographic barriers to care, we have found it challenging to have confidence in a neurologic evaluation and examination with only an audio–video link. A telehealth consultation during which a patient is in a room with a qualified clinician who can be coached through a pediatric neurologic examination by a pediatric neurologist is a critical component for incorporating remote team members successfully. Even with that, some patients may need an annual in-person visit to a child neurologist. Once a clear diagnosis and treatment plan has been designed, continuing treatment remotely by working with physicians, physician extenders, and a team to facilitate patient engagement, assist with data abstraction and verification, and ensure complete follow-up examinations is more realistic. The team-based approach in a clinical practice as outlined above supports this virtual practice. As also noted above, technology has had an impact on the definition of the points of care and HIT infrastructure that supports each team member and their point-of-care contributions are needed, as is telemedicine that connects the patient with the provider. Virtual pediatric neurology team-based care can be an opportunity to facilitate enhanced accessibility and quality care for pediatric neurology patients in underserved areas such as Wyoming. To be successful, we must be more cognizant of provider efficiencies and create time for pediatric neurologists to impact more lives. Team-based processes, supported by technology, improve data acquisition and verification and also provide the observations and background information about the patient by each team member, including the pediatrician and adult neurologist. Once all the relevant medical information is abstracted and contextualized, it can be formatted and presented to the pediatric neurologist, either in person or remotely, who can then assimilate the information, diagnose the condition, and outline a treatment plan. 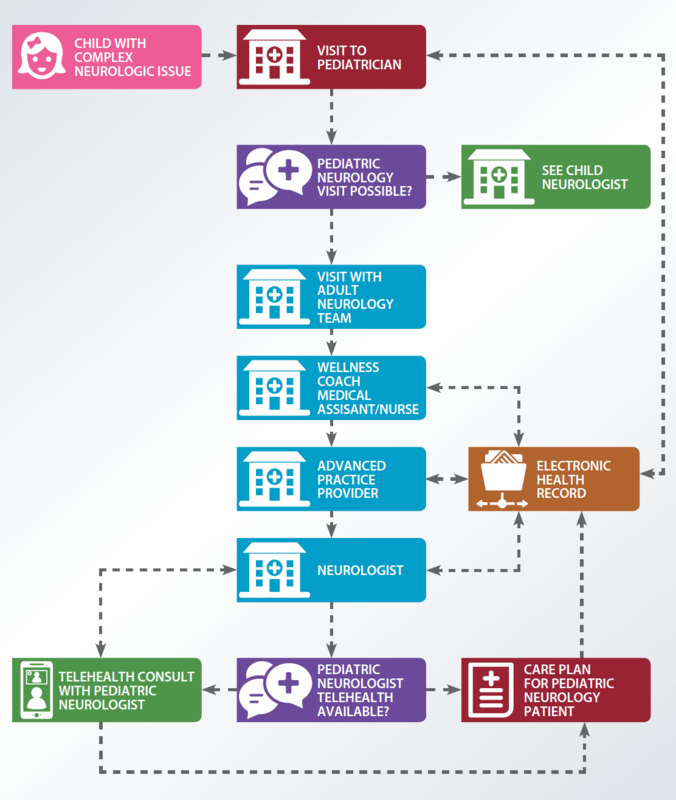 The pediatric neurologist’s diagnosis and treatment plan, in turn, can be integrated into the referring providers’ information technology platform so the referring provider can, with the use of technology, track the patient’s care plan. The pediatric neurologists may have the ability, via teleneurology, to follow up on a regular basis and review the ongoing treatment plan being carried out by the local pediatrician and general neurology team. Payment model innovations will need to consider total episodes of virtual care, so the efforts of the combined team are appropriately compensated. We also need to eliminate policy vocabulary that prevents patients from accessing health care regardless of where the patient and physician may be geographically located. Appropriately utilized technology solutions break down time and distance barriers and connect providers with patients no matter where either may reside. This can improve accessibility, efficiency, and quality of health care. 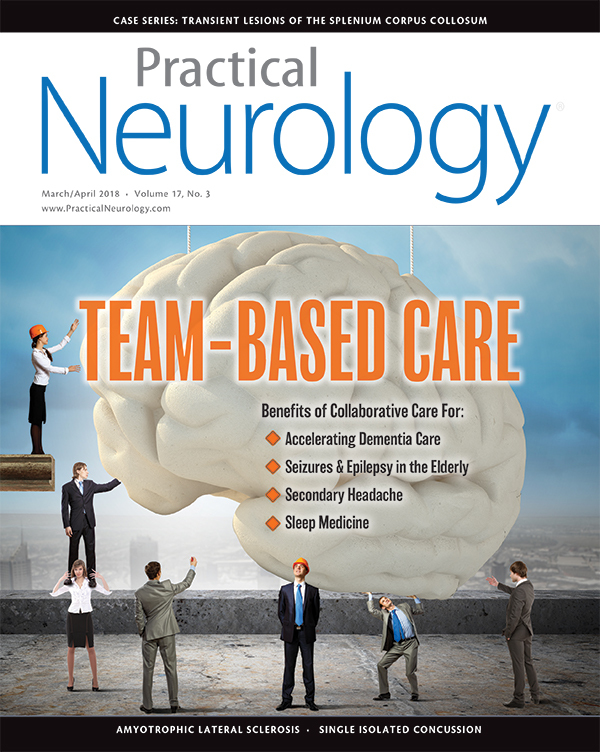 The team-based approach partnered with technological innovations can allow specialized fields such as pediatric neurology to expand their practices and the number of patients they serve, thereby closing the provider-to-patient gap. 1. Kang PB, Bale JF, Mintz M, et al. On behalf of the Section on Neurology Executive Committee of the American Academy of Pediatrics and the Board of Directors of the Child Neurology Society. The child neurology clinical workforce in 2015: report of the AAP/CNS Joint Taskforce. Neurology. 2016;87:1384-1392. 2. Gilbert DL, Horn PS, Kang PB, Mintz M, Joshi SM, Ruch-Ross H, Bale JF Jr. Child neurologyr and training: views of residents and child neurologists from the 2015 AAP/CNS Workforce Survey. Pediatr Neurol. 2017;66:89-95. 3. Freeman WD, Vatz KA. The future of neurology. Neurol Clin. 2010;28:537-561. 4. Sanjeev A, Kalishman SG, Thornton KA, et al. Project ECHO: a telementoring network model for continuing professional development. J. Cont Ed Health Prof. 2017;published online Nov. 15. 5. Ayanian JZ, Clark SJ, Tiperneni R. Launching the healthy Michigan plan-the first 100 days. New Engl J Med. 2014; 371:1573-1575. 6. Anand V, Biondich PG, Liu G, Rosenman M, Downs SM. Child health improvement through computer automation: the CHICA system. Stud Health Technol Inform. 2004;107:187-191. 7. Sinsky C, Colligan L, Li L, et al. Allocation of physician time in ambulatory practice: a time and motion study in 4 specialties. Ann Intern Med. 2016;165:753-760. How I addressed a relative lack of training in practice management and business aspects of providing health care to better help the patients I serve. A careful history and high degree of suspician are needed for accurate diagnosis. A report from the 6th International Congress on Multisystem Atrophy. A focus on multidisciplinary care. Aggressive diagnostic and therapeutic approaches are often unnecessary. Providing sound advice after a single isolated concussion.